I was utterly shocked when I looked up my See Jane Tri race results today and found that I’d placed 4th in my age group and 29th out of 325 women. The funny part of this was, my sister and I were joking through the awards ceremony that we should be listening for our names as they recognized the top three in each age group. I had no idea how close I was. I’d gone into Saturday’s race knowing that I might need to skip the run if my foot hurt, so I gave everything I had to the swim and run. I went out really strong on the swim and surprised myself with my pace. Toward the end of the swim I spaced out as I tried to remove water from my goggles and de-fog them so I could see where I was going. 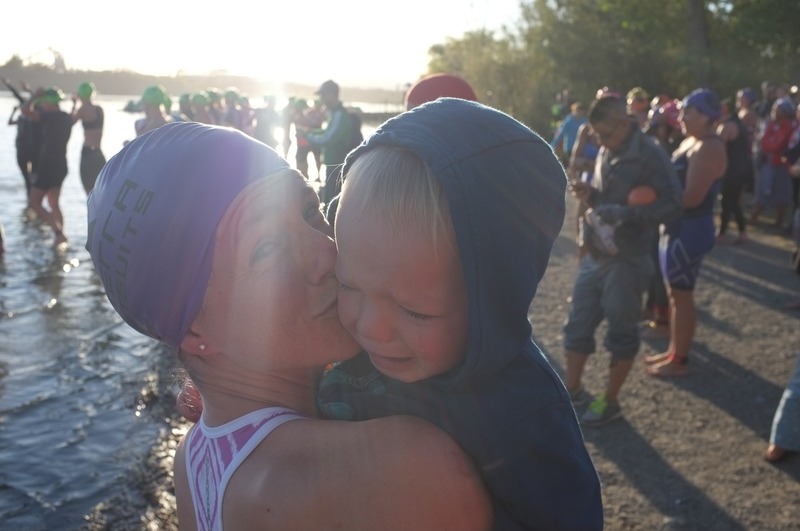 I came out of the swim fast and hurried through my first transition. Once on my bike, I flew by many other cyclists, my only goal being to catch my sister so I wouldn’t need to start the run alone (in the event that my foot didn’t hurt). The 8 mile bike course went by surprisingly slowly but right at the end I spotted my sister (who’d done the entire ride in one gear because her borrowed bike was making suspicious noises whenever she tried shifting). We changed into running shoes together and ran out of the transition area. My first thought was that my feet were blocks of ice and I had no idea if my foot was hurting. I’m used to running triathlons on frozen feet so this wasn’t anything more than a pleasant surprise to me since I felt no pain. We chatted though the run but kept a decent pace. As the finish line came into view, I yelled “let’s go” and she took off at a sprint. I was sort of kidding since I wasn’t sure I could sprint all the way in but we managed to cross the finish line together and smiling. This race has become a special event to me. 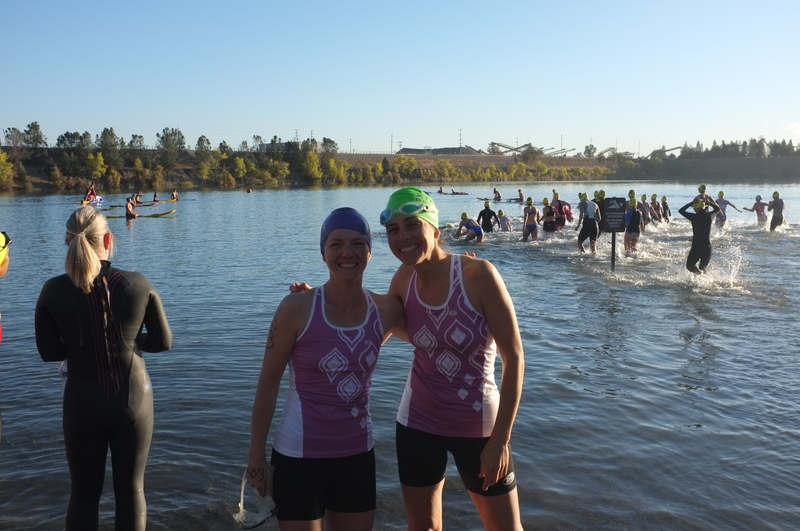 The first year I entered, I made a new friend from a last minute carpool and enjoyed wearing my really cool SuperJane race shirt for months after. 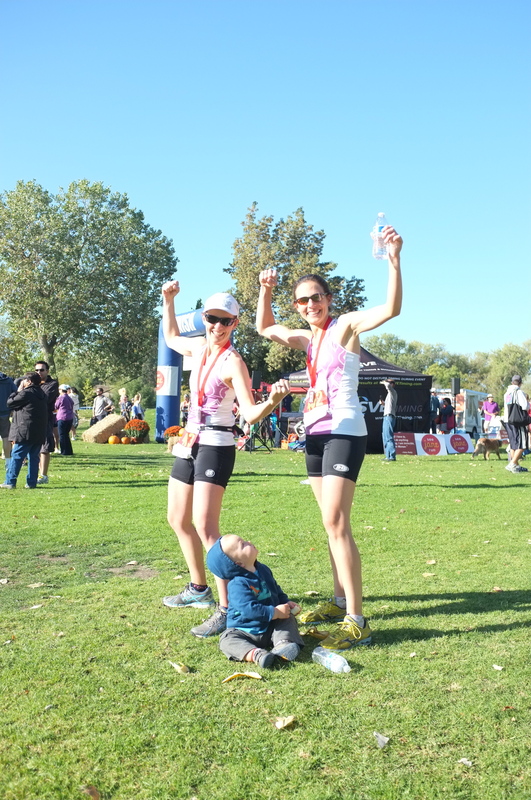 Last year another new mom friend joined me to do her first triathlon and my first post- baby race. We felt triumphant for completing both the training and the race with six month old babies. This year my sister flew in from Georgia to participate in her first triathlon and I was reminded how much I love sharing my passion for racing with others!